Welcome to this episode of the Real Fast Results podcast! Gina Henry is today’s special guest. She is an expert when it comes to being able to travel and make money at the same time. In fact, when this episode was recorded, she was in Austin, Texas, traveling and visiting friends, but at the same time, she taught a group about how to travel and make money. So, Gina had actually been traveling and making money herself. Well, I think the importance of travel… I know in my life, and [that of] many of our listeners and viewers, it’s stimulating. You’re learning, you’re seeing things differently, you’re meeting new people, you’re exposed to new cultures, even if you are here in the U.S. traveling. There’s a stimulation, I think, and I get so much out of it. It helps me with my writing, my speaking, my business ideas, and my brainstorming. It gets you out of a rut. You can not only use your travel for inspiration, but also, at the same time, maybe work on the road. That can make part of your trip a business trip, and a possible tax reduction (part of it). But, the whole idea is that you’re out there, getting inspiration, and you’re coming up with new ideas. Maybe you’ll have time to focus on those ideas, and maybe without some of the distractions that you may have at home. You can look at my website, which is GinaHenry.com. 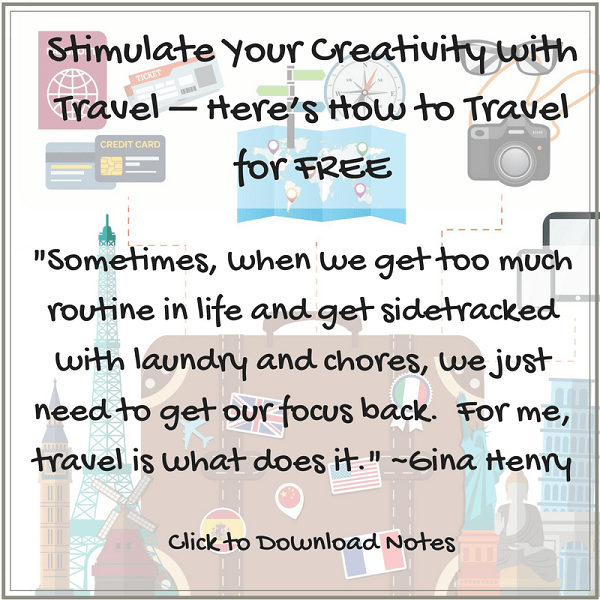 You can also email me at GinaHenryTravel@gmail.com. You can see my class schedule on my website. I’m all over the country, in 90 different cities, and I spend several months out of the year out of the country. You’re welcome to join me. My whole plan is to take people out there traveling and help you to really have the confidence, the time, and the money to be able to travel as much as you want.